StickFont v1.1 is a free Windows program you can use to create single-stroke text for engraving. 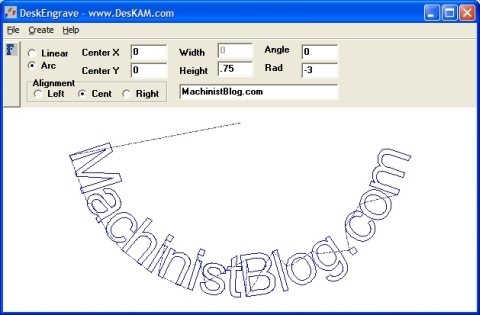 It’s very similar to another free program we’ve written about called DeskEngrave. Both programs will take a line of text and generate the g-code you’ll need to engrave it using a CNC mill, router or similar machine. If you want, you can easily set parameters such as z depth, retract, plunge and feed rate, etc. StickFont can create text using any font installed on your PC. But working with Windows fonts is not as easy as it is with DeskEngrave because you have to convert them to a “CHR font file” first. It’s easy, but it’s an extra step. If you don’t like any of the fonts on your computer then check out the 14 good-looking free fonts you can download from their web site. I’ve played with StickFont on my laptop but I haven’t been able to try it out because I have a 400-pound jump shear parked in front of my mill while I reorganize my workshop. If you could try it out and let us all know how well it works I’d appreciate it. By the way, there’s an older version of StickFont with fewer features floating around the net. This is a quick review of DeltaCAD, an inexpensive and easy-to-use 2D CAD program with a short learning curve. I highly recommend it, unless you need to design and draw complex parts or make 3D drawings. If you’ve been looking for a simple CAD program then invest a few minutes and take a look at this one. The fully functional demo won’t take long to download or install, and it will work for 45 days with absolutely no restrictions. And you can buy it for only $40, which I think is a bargain. DeltaCAD reads and writes industry standard DXF and DWG files, which makes it compatible with almost all other CAD programs. It loads almost instantaneously, which makes it a great viewer for looking at CAD files you find on the net. It has so many features that I’m not even going to try and list them all. 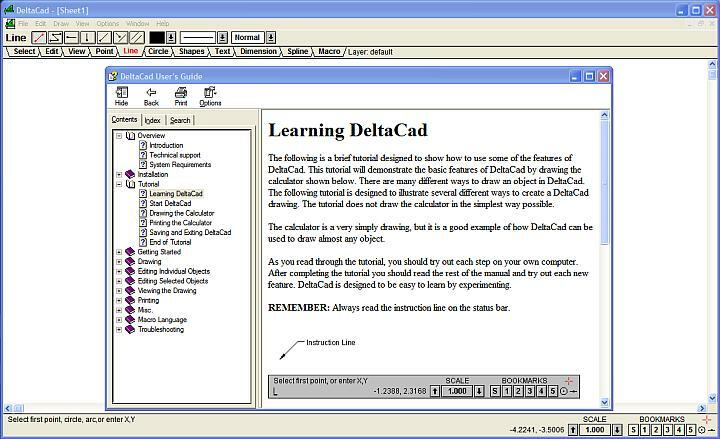 And DeltaCad has been around for a long time, since 1995, and it’s always being updated and improved. The other programs were really powerful, almost designed to do all things for all people. In other words, they were bloated with features that many users, especially home machinists, would never use. They often didn’t come with a tutorial or some other way to help a new user get started. They also typically came with documentation that would be great at telling you the obvious, like “Click on the line icon to draw a line,” but leave out basic details, like how to make it a certain length or at a certain angle. DeltaCAD just seems to have been designed to be easier to use. It also comes with a simple tutorial that will get most people started making useful drawings in about an hour. You’ll find DeltaCAD’s tutorial in the help menu. The tutorial will guide you step-by-step through the process of drawing a calculator, showing all the different methods you can use. I think most people will probably be able to complete it in about 30 to 60 minutes. Unfortunately, it doesn’t show you how to add dimensions to a drawing, which is really easy. So after drawing the calculator you may want to take a quick look at the “dimension” topic, which you’ll find in help under “drawing.” Afterward, I think you’ll know enough to start making your own drawings. If you have questions you can ask them on the DeltaCAD User’s Forum, where you will also find a library of drawings, symbols and macros to download. There are some good reasons to learn how to use a more powerful and complex CAD program. For example, I’ve been told that many of the 3D CAD programs will help make certain that the parts you design will fit together properly. If you make a change to one part they can automatically make changes to the others so that critical dimensions and things like bolt holes will continue to match up. So someday, if I start designing more complex projects and making them on CNC machines, I may need to learn how to use an affordable 3D CAD program like Alibre or Dolphin CAD. But so far DeltaCAD has been more than capable of meeting my needs and I’m going to continue to use it. 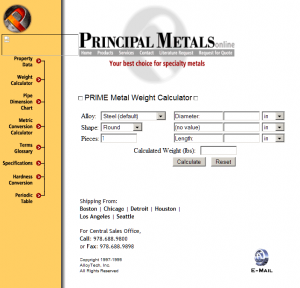 Here are a couple of calculators that you can use to determine the weight of a piece of metal. You just have to tell them the kind of metal, its shape (round, square, tube, plate, etc.) and its dimensions. The first is a downloadable calculator that will run on a PC. The second is an online calculator you can access from a web browser. Both calculators will accept dimensions in either English or Metric units, but for some strange reason they only give the results in pounds. I used one of them to see if I paid a good price for some of the cutoffs I bought yesterday at a surplus metal store. I paid $8/pound for a piece of brass that was 1.625-inches in diameter and 12.5-inches long. I determined by using one of the calculators that Enco charges $6.02/pound. But I would have had to purchase a 6-foot long piece for $270.89, even though I need a piece less than 2-inches long for the project I’m making. Yesterday I thought that was an acceptable price, but today I am kicking myself really hard. I just checked Smallparts.com and discovered that I could have bought a slightly smaller piece (1.5 x 12-inches) for $17.76, which works out to $2.17/pound. Ouch, ouch, ouch.